PRESIDENT David Granger has ordered a full investigation into the riot at the Camp Street Prison which has claimed the lives of 17 inmates and injuries to over half of a dozen others. In a statement by his office, President Granger also extended deepest sympathy to the families and other relatives of the 17 prisoners, who perished during the riot. “The President is deeply saddened at the loss of life and has ordered the immediate establishment of a Commission of Inquiry (CoI) to investigate the circumstances and causes of this tragedy to ensure that there is never a recurrence,” the statement added. The President assures the family members of the deceased and injured that everything will be done to ensure that there is a full and complete investigation. President Granger, also at an emergency meeting of the National Security Committee (NSC), which he called Thursday afternoon, instructed Minister of Public Security Khemraj Ramjattan to set up the three-member commission, which will not only investigate the circumstances surrounding the deaths, but will also make recommendations to prevent the recurrence of similar incidents. The names of members of this commission are expected to be made public by today. The President has also mandated that every effort be made to ensure that the situation is brought under immediate control. The minister said these included placing additional human resources to the prison staff roster. To this end, he said the number in terms of staff total at the Georgetown Prisons has not been attained, even though training is ongoing. The inmate capacity of the Geogetown Prisons caters for 600 persons, but as of Thursday, the number of inmates stood at 984. 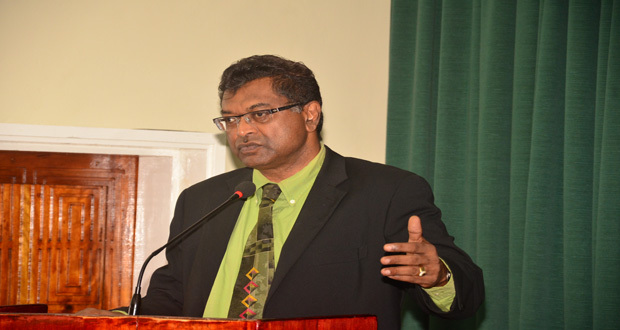 Ramjattan noted that one of the considerations discussed is the upgrading of the Mazaruni Prison in order to accommodate inmates from the overpopulated Georgetown Prison. The Public Security Minister added that a major bugbear facing the authorities is sloth in time for trials for persons who are on remand. “That is also a bugbear that creates tremendous frustration and vexation in prisoners, especially in Capital A,” he said. He noted that the situation in the Capital B and Capital C sections of the prison is fairly good, but some prisoners were protesting the long years they have to wait for trial. “That has to be looked at in a conjoint effort with the judiciary,” he added. The minister posited that the overpopulation is also caused by persons who are charged and are unable to source their bail money. “So we may very well have to persuade people, knowing the economic circumstances of persons charged and accused as to quantum of bail or even not remanding them,” he noted. He said this will not happen in the near future since the capital amounts to pursue such a project may be too much. The possibility of shifting prisoners to other jails around the country may be a possibility, but Ramjattan noted that the Director of Prisons may have to adopt a measured approach in this regard. He explained that for the prison in the city, there is a quicker reaction time for back-up services from sister organisations such as the army and police to address situations such as the one that occurred on Wednesday and Thursday. Although there may be space such as at the Mazaruni Prison, the reaction time may be beyond the authorities in certain eventualities, the Public Security Minister said.